I’m on a roll with caffeine! If I’m not drinking it, I’m using it for my skin. 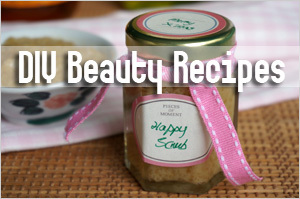 For those who remember, my last DIY beauty post was about a caffeine scrub using ground coffee powder. But since writing that post, I’ve developed rashes on my body and I can’t use any body scrubs at the moment. So what do I use the big packet of ground coffee powder? 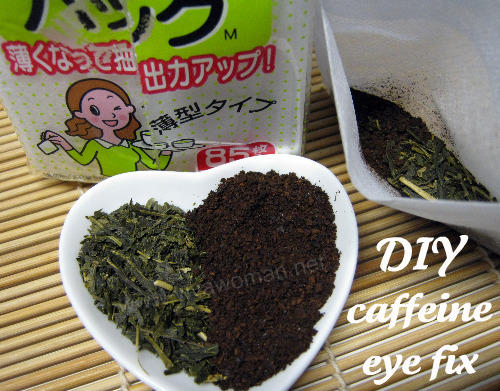 How about a DIY caffeine eye bag fix? And instead of just using the ground coffee in this beauty remedy, I’ve also added green tea leaves that contain caffeine as well. Caffeine is widely known to reduce puffiness, ease swelling and increase circulation when used around the eye area as the ingredient is able to help shrink the blood vessels. 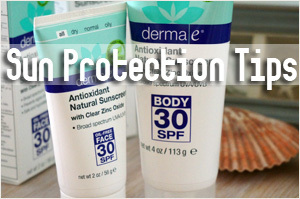 You probably have come across several eye creams containing caffeine. 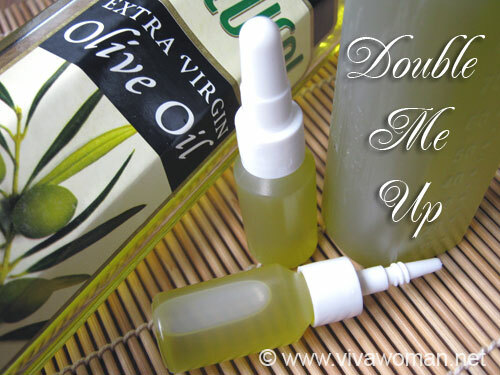 I’m not sure whether they work but you can always start off with caffeine on your eye area with this simple DIY recipe. 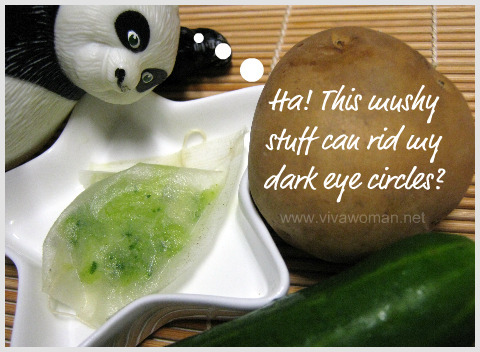 In fact, some are even suggesting that caffeine is helpful in reducing dark circles under the eyes and Rennie just mentioned in this entry that her friend has success with using tea bags to reduce dark circles after a month. 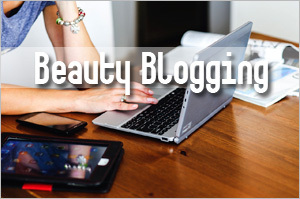 I guess the success rate will depend on the severity and causes for the dark circles. Green tea on the other hand contains caffeine and tannin, and the later is said to diminish water in the tissues and tighten the skin around the eyes. 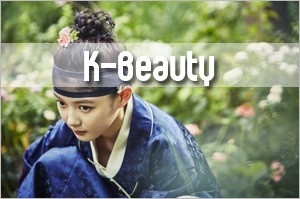 It is also said to work on dark circles by decreasing the dilation of the blood vessels under the eyes. 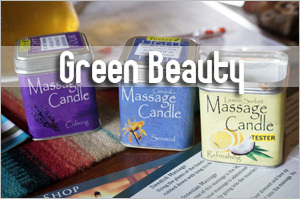 Green tea also contains a high level of polyphenols that work well as antioxidants for the skin. 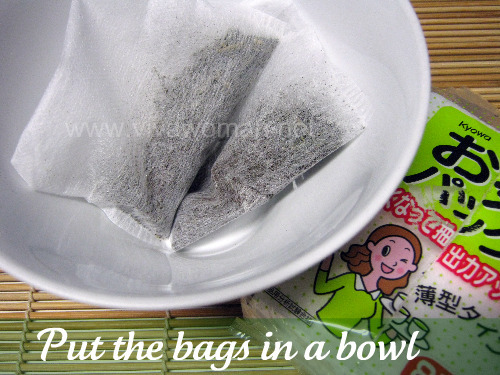 I bought a pack of the disposable tea bags for my DIY eye mask but these bags are great for this recipe too. 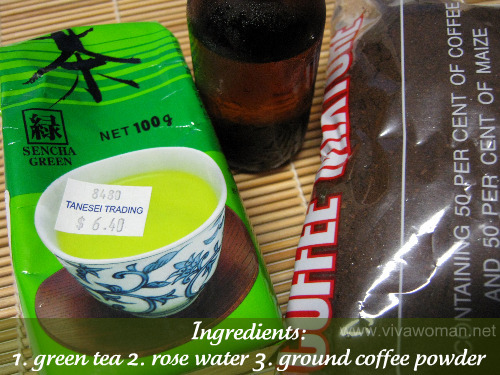 Just divide the portion of ground coffee powder and green tea leaves equally and put them into two of the tea bags. Place the two bags into a clean bowl. 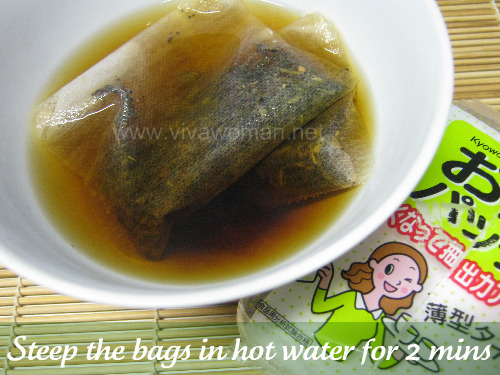 Pour steaming hot water into the bowl and steep the bags for two minutes before throwing away the water. Do not steep them any longer or the caffeine could lose its potency. Let the two bags cool down, squeeze out the excess water but not too dry as they should be kept damp. You have an option of either placing them on your eyes while they’re still slightly warm or even using them after you’ve chilled them for awhile in the fridge. I read that using them warm can help increase blood circulation around the eye area. If you use them chilled, they’ll help to soothe and relax your tired eyes. I’ve tried both but the cooled bags seem more pleasant in our warm weather. What I do is to douse the bags with a little rose water to increase the soothing effects before placing them on my eyes. And I also feel an immediate tightening effect around the eyes using them this way. Okay, some of you are probably thinking this is too much trouble and why not just settle for used tea bags. That’s possible of course, but this is fun to me and anyway, I’m loving these disposable tea bags. They’re so handy in my DIY eye recipes. I found them at a medical hall in Serangoon Gardens going for $3.50 per pack and I have 85 bags to play with. So I’m definitely going to have my fun with all of them! 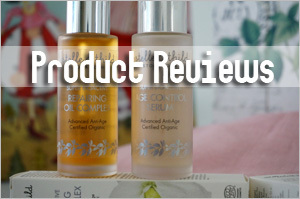 Previous Post: « Is a tingling sensation on the skin good or bad? oh man i really need this for my tired puffy eyes right now! 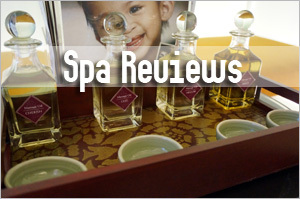 I am so happy to see rose water mentioned. Where did you get them? Is this edible like the ones used by sarabat stalls to make teh tarik or bandung? Ah no, not the edible ones…this is cosmetic grade. I got it from a DIY ingredient supplier. 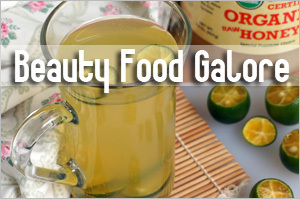 Not sure if those used to make the drink can be used for the skin. 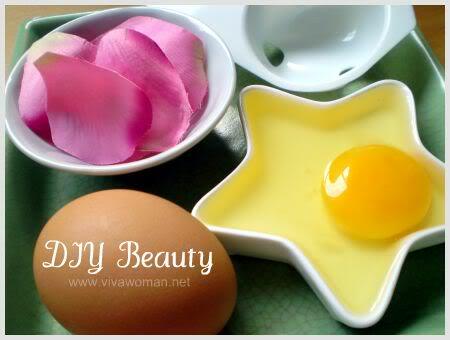 I were using rose water intended for cooking and it has absolutely no affect on my skin, so for skin care needs is better to use cosmetic rose water. 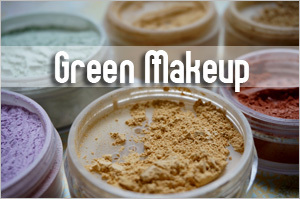 I agree…it’s always better to use those of cosmetic grade for the skin. I am really surprised to hear that you apply caffeine directly to your eyes. Are you aware of the potential negative side effects of tannic acid? 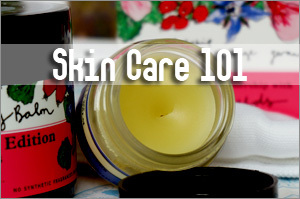 Especially since what you put on your skin is directly absorbed into your blood stream. If you google side effects of tannic acid, besides the potential of being very drying for the skin, you are told not to use tannic acid if you are pregnanat or nursing, have a kidney or liver disorder, have a fever, infection or any heart conditions. I actually used to take a bunch of tea bags and put them in my bathtub because I wanted to reduce the appearance of cellulite (LOL)…but then I heard of how drying it is on the skin and the possible negative side effects, it just wasn’t worth it. Thanks for pointing out about tannic acid. My understanding is contrary to popular belief, tea does not contain tannic acid – it seems there are some debates on the topic too. Perhaps coffee contain it. Anyway, I don’t use this daily…maybe once or twice a week or when I can remember. I should have added that it’s important to moisturize after using such bags on the eye area; I assume that pple knew to moisturize after a mask of sorts. But I would imagine more harm ingesting these stuff than using on the skin? Anyhow, you’re right that it’s always better to be careful – especially if one has a medical condition. would it not be safer to just appy caffeine powder mixed with any type of skin cream around you eye and leave out the tea part ? or are you reffering to putting it on the eye it self ? I wouldn’t recommend applying it cos the powder is not fine. This is just to use as a eye mask. You can leave out the tea if you wish. I see…I have no idea. Your post is pretty illuminating and practical,I completely agree with the above comment. Thanks for the sharing. isit can use any used green tea bag ? care to tell which brand of rose water u using? 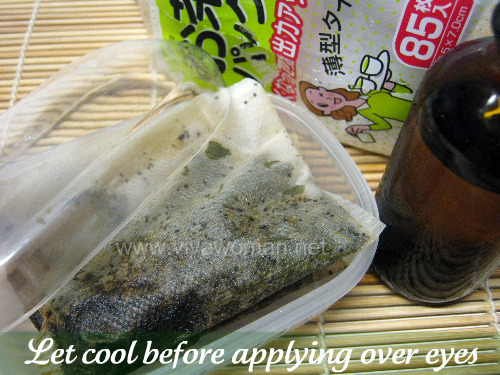 You can use used green tea bag but it should not be too old. 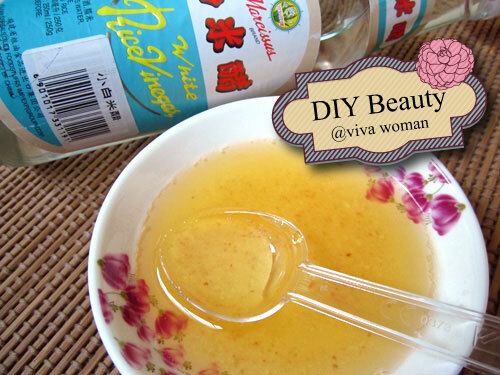 The rose water I use has no brand – a DIY ingredient. how many time you do this in week two times or every day ? I have big dark cyrcl around my eyes becouse I dont get enough sleep do you think I can ues this for dark cyrcl also? You can try…maybe twice a week to see if it works. However, a lot of times, if you don’t have enough sleep, or your dark circles are due to some internal issues, then external application will only help in a limited way. Try get more sleep!